Cedar Mountain Woodwrights came from a passion for artistic woodworking and high quality cabinetry. A family owned company, we operate on a small scale to maintain quality and service in historic Ellensburg, Washington with the help of our four employees. From our in-house design services to our on-site install, we aim to offer the highest quality cabinets and furniture for prices often below those major retailers. We collaborate with home owners and architects to help realize your dream kitchen or build a custom-fit bookcase for your treasures. We also work with a variety of techniques and materials including reclaimed timbers to achieve a unique look and make positive impact on our environment. We have had many opportunities to work on all type of home projects with a variety of architects and designers. We also provide our own in-house design service. Don’t be discouraged by the high prices at the furniture store! We can usually beat the pricing of good quality furniture and still provide completely custom pieces with even greater quality standards. 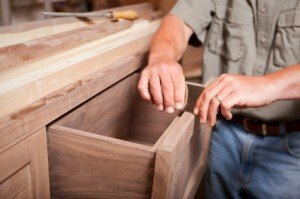 We have built many pieces with authentic mortise and tenon assemblies and love to use many of the older furniture making techniques when the project requires a truly hand-made approach. We use many re-claimed materials that add much character and intrigue to our products. We also believe in doing our part to preserve the environment in which we live, so if you visit our shop you will see that we try hard not to throw usable materials away.